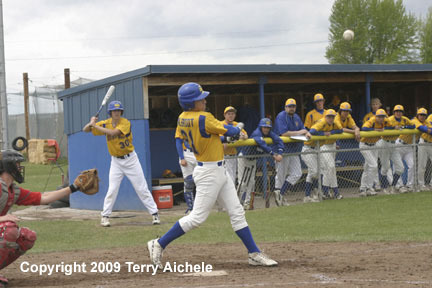 STANFIELD - The Stanfield Tigers swept the Weston MeEwen TigerScots in a doubleheader on Saturday, May 2, 2009. The Tigers won the first game by a score of 7-0 with Mario Madrigal being the winning pitcher. Madrigal helped himself by going 2 for 3 at the plate including a double. His battery mate Mike Fisher was 1 for 2 with a triple. 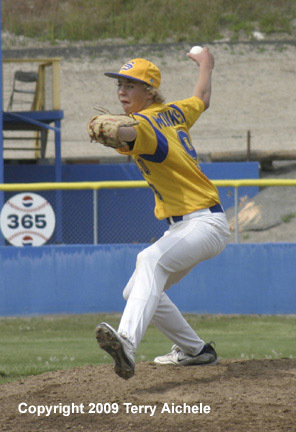 Stanfield's Derek Monkus was the winning pitcher in the second game that the Tigers won 13-3 under the ten run rule. Mike Fisher, Quin Grogan and Jack Taylor all went 2 for 3. 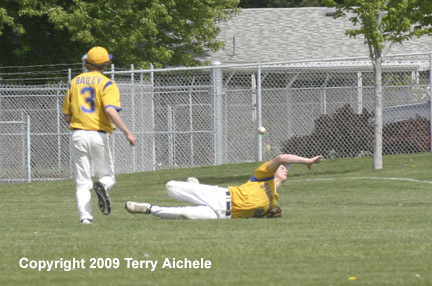 Taylor had a base clearing double. 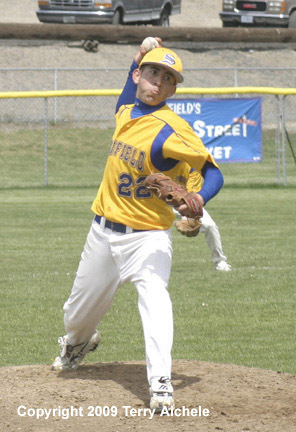 Stanfield started the scoring in the bottom of the first with two on when Quin Grogan hit a grounder to to the pitcher who overthrew firstbase bringing in two runs. Monkus and Fisher scored on that play giving Stanfield a 2-0 lead. Stanfield scored in the bottom of the second on a Monkus hit to centerfield giving the Tigers a 3-0 lead. The Tigers scored twice in the bottom of the third. 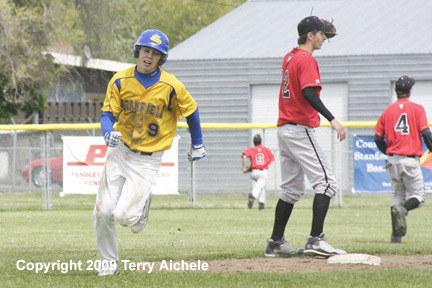 The first run scored when Jack Taylor scored from third on a wild pitch. 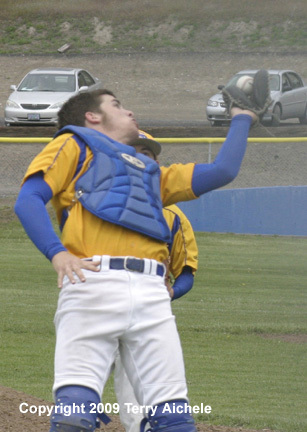 Madrigal then hit a long shot to rightfield scoring Trevor Morris from secondbase. 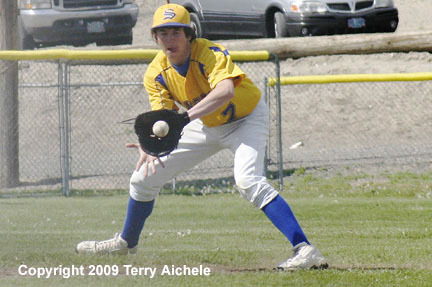 Stanfield led 5-0. The Tigers scored twice in the bottom of the fourth. Monkus scored from firstbase on a triple by Fisher. Then Fisher scored on a wild pitch to give the Tigers the 7-0 lead. Neither team was able to score in the last three innings. Weston McEwen scored a run in the top of the first on a wild pitch. Stanfield had the bases loaded in the bottom of the first when Jack Taylor hit to deep centerfield scoring Tyler Hawkins, Devin Bailey and Fisher scored giving the Tigers a 3-1 lead. Next up Shawn Milbrodt hit to deep leftfield scoring Taylor giving the Stanfield the 4-1 lead at the end of the first. The next runs came in the bottom of the third with two on and Madrigal hit deep to centerfield bringing in Taylor and Milbrodt to give the Tigers the 6-1 lead. The Tigers scored a run in the bottom of the fourth when Taylor hit to rightfield bringing in Grogan. That gave the Tigers the 7-1 lead. The TigerScots scored two runs in the top of the fifth making the score 7-3. 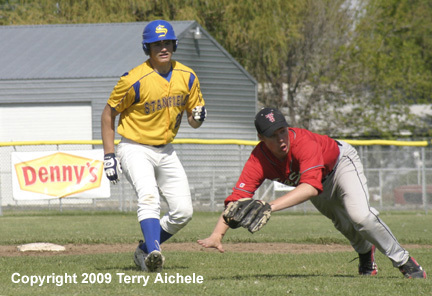 Stanfield scored big in the bottom of the fifth. After loading up the bases when Madrigal scored on a force on a walk. 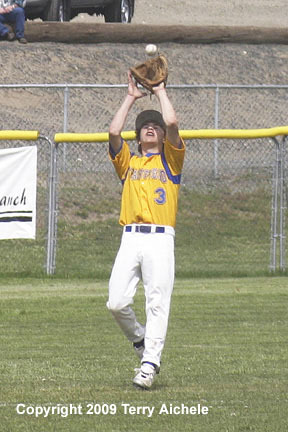 Then Fisher hit a grounder scoring a run making it 9-3. Then a run scored on a wild pitch. Next a run scored on a ground ball making the score 11-3. Taylor then hit a grounder to short everyone was safe allowing two runs to score - Hawkins and Grogan. That made the score 13-3 ending the game under the ten run rule.